My love of painting evolved from a life-long love of wilderness. Having spent years walking along mountain paths, I wanted to dive deeper into the colors, the movement, the shapes of that untamed world. 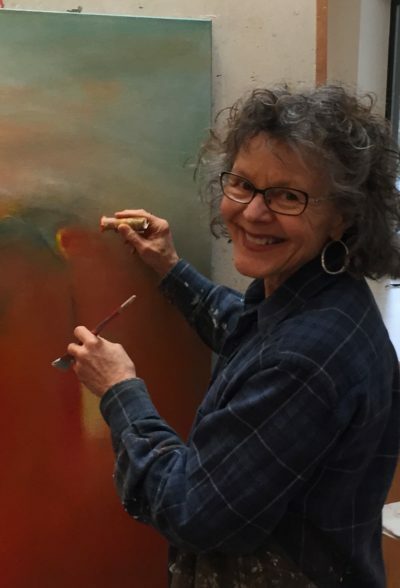 Painting abstractly became the vehicle for this personal immersion. I soon found that the play of color, form, line and texture across a canvas moved me as much as the shifting of light and shadow across the forest floor, the glint of sunshine on rushing water. In my paintings I hope to convey the joy I feel in wild terrain. My work is process driven: a spontaneous conversation develops as I layer, scape back and draw into the painting. Using oil paint, acrylic, charcoal, cold wax and pastel, I am always searching for those moments when plans, ideas, even words drop away. Then there is just the experience of discovery, the excitement of seeing a random mark pull the painting in a new direction, the pleasure of watching the way shapes interact and light draws the eye.